The Bata Shoe Museum is a specialist museum, with a distinct focus. Working within its particular scope, the Museum’s latest temporary exhibition has found a topic and approach to exhibiting it that extends into popular culture… and seems to be making an impact. Out of the Box: the Rise of Sneaker Culture, is the first exhibition in North America to showcase the history of sneakers. 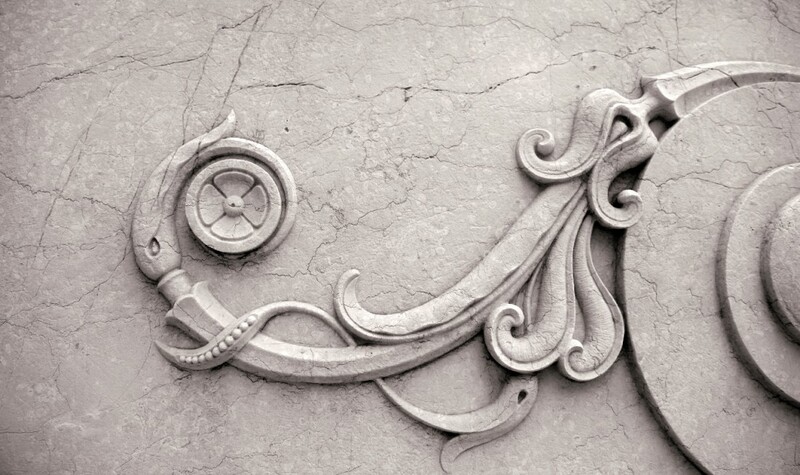 How could such ubiquitous part of our lives never have been presented in an exhibition before? Perhaps it is just that: sneakers are everywhere, everyone wears them — they seem unremarkable, not worthy of a museum exhibition. However, Elizabeth Semmelhack, curator of the exhibit, challenges our assumptions and by “making the familiar unfamiliar” inspires us to look at what is on our feet anew and to enjoy museum collections and history while we are doing it. However, the show also has “star quality”, including the latest designs from fashion designers and sneakers made for celebrities and sports heroes. The design of the exhibition reinforces the leaps and bounds made by the sneaker and its place within the flux, speed, and charge of society. Photograph of the exhibit installation designed by Karim Rashid. Photo copyright 2013 Bata Shoe Museum, Toronto, Canada. The exhibit’s design has immediate impact, creating an environment that expresses the exhibit’s content boldly but not literally. 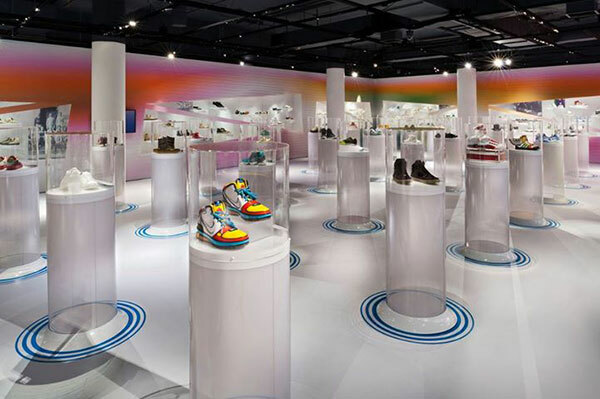 Central circular cases, each with a single shoe or pair of shoes, achieve that often-sought quality of museum design – creating a compelling environment, but not competing with the collection. That perennial 20th-century museological conundrum — how much text is too much — is neatly solved with searchable historical and technical information provided via flat-screen TVs that take the place of overview text. Not many museums have sneakers in their collections and so what can we see in this exhibition that applies to exhibit programs in other museums? With Out of the Box, we can see a temporary exhibition taking a simple, everyday typological category, exploring it from many vantage points, finding contemporary expressions, placing the collections in a dynamic physical space — and making an impact. The exh ibition continues to March 30th 2014 and is accompanied by a wide range of programming described on the Museum’s website. Here are some of my favourite sneakers in the show. All images shown are copyright 2013 Bata Shoe Museum, Toronto, Canada. Dutton and Thorowgood running shoes, 1860-1865. This shoe is thought to be the oldest extant running shoe. It is similar to a man’s dress shoe but the spikes on the sole give it away as a running shoe. Collection of the Northampton Museums & Art Gallery. Keds Champion, 1916. This Champion sneaker, designed for women, is from the first year of the Keds brand. Collection of the Bata Shoe Museum. Bata sprinting shoes, pre-1939. A performance runnig shoe with leather soles and uppers with spikes for traction. Collection of the Bata Shoe Museum, gift of Bata Tilbury. adidas Superstar, c. 1974. The adidas Superstar debuted in 1969 and was the first low-cut leather basketball sneaker. Collection of Adidas Archives. Bata x Wilson x John Wooden, 1977. This shoe features a revolutionary polyurethane sole that was exceptionally light to reduce fatigue and improve endurance. Despite the sneakers’ design excellence it was only available for one year and today is one of the most sought-after sneakers for collectors. Collection of Bata Shoe Museum. Adidas Orion worn by Terry Fox, 1980. Collection of the Bata Shoe Museum, gift of the Canadian Cancer Society. adidas Micropacer, 1984. These sneakers had a micro sensor in the left toe that could record distance, running pace and caloric consumption. The readout screen was on the left shoe. Collection of the Bata Shoe Museum, gift of Phillip Nutt. Nike Air Jordan 1,1985. Nike began making sneakers for the Chicago Bulls rookie, Michael Jordan in 1984. Collection of Nike Archives. Nike Foamposite, 1997. Eric Avar’s striking sneaker, the Nike Foamposite, marked the first time that an entire upper had been made of one piece of synthetic material. Collection of Nike Archives. Fessura x Karim Rashid Karim Collection for Fessura, 2006. This limited edition sneaker features a removable upper and was donated to the Museum by the designer. Collection of the Bata Shoe Museum, gift of Fessura and Karim Rashid. Christian Louboutin Roller-Boat, 2012. These sneakers feature Louboutin’s iconic red soles and gold pony skin uppers embellished with studs. Collection of Christian Louboutin. Prada Kiltie Wingtip, 2013. Collection of the Bata Shoe Museum, gift of Holt Renfrew. Categories: museum exhibits | Tags: Christine Lockett, Elizabeth Semmelhack, fashion, Sneaker Culture | Permalink.